What's Beneath Kilauea Hawaii's Most Active Volcano? Kilauea is a currently active shield volcano in the Hawaiian Islands and the most active of the five Hawaiian volcanoes. Kilauea is the most active volcano on the Earth. Located along the southern shore of the island. Lavas younger than 1,000 years cover 90 percent of the volcano; the oldest exposed lavas date back 2,800 and 2,100 years. The first well-documented eruption of Kilauea occurred in 1823, and since that time the volcano has erupted repeatedly. Most historical eruptions have occurred at the volcano's summit or its southwestern rift zone, and are prolonged and effusive in character. Like all Hawaiian volcanoes, Kilauea was created as the Pacific tectonic plate moved over the Hawaiian hotspot in the Earth's underlying mantle. Following the pattern of Hawaiian volcanic, Kīlauea would have started out as a young submarine volcano, gradually building itself up through subsurface eruptions of alkali basalt before emerging from the sea with a series of explosive eruptions about 50,000 to 100,000 years ago. Since then, the volcano's activity has likely been as it is now, a continual stream of effusive and explosive eruptions of roughly the same pattern as its activity in the last 200 or 300 years. Kilauea has a large summit caldera, measuring 4 by 3.2 km with walls up to 120 m high, breached by lava flows on the southwestern side. Kilauea formed over several centuries, with its construction estimated to have begun about 500 years ago, and that its present form was finalized by a particularly powerful eruption in 1790. A major feature within the caldera is Halemaumau, a large pit crater and one of Kilauea's most historically active eruption centers. The crater is approximately 920 m in diameter and 85 m deep, and its form has varied widely through its eruptive history; the floor of the Halemaumau Crater is now mostly covered by flows from its most recent eruption, in 1974. Magma rising into Kilauea Volcano first enters a principal storage reservoir beneath its summit caldera. 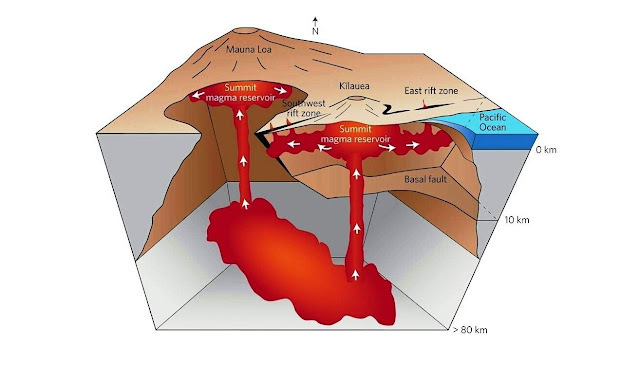 The magma may then erupt at the summit or move through one of two principle pathways (rift zones) beneath the flanks of Kilauea (arrows show direction). This movement of magma down the rift zones causes the summit area to subside, which is recorded by tiltmeters as an inward tilt of the caldera rim. When magma is not moving down one of the rift zones, the summit caldera inflates slowly as shown by an increase in ground tilt, indicating magma is rising into the summit reservoir. Aerial view of Kilauea Volcano's summit caldera and east rift zone. The east rift zone of Kilauea Volcano. A series of craters, cinder cones, and ground fractures leading from the summit caldera of Kilauea Volcano marks the east rift zone. The line shows the approximate location of rift zone between caldera and Pu`u `O`o (Puu Oo). The rift zone consists of a series of fractures within the volcano through which magma moves from the summit reservoir. Kilauea's summit caldera and Halemaumau crater are in the foreground. A gas plume from Puu Oo rises in the background. 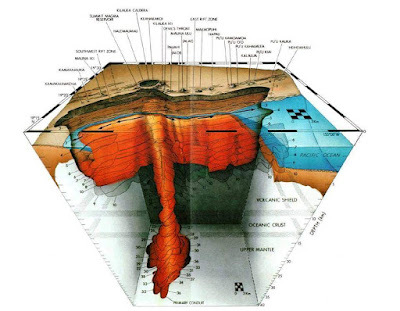 The remarkable tilt pattern at the caldera in the 1980's showed that the summit magma reservoir is often in delicate balance with the reservoir system beneath the east rift zone. The pattern of tilt at Kilauea helps determine when magma is on the move down one of the rift zones and when it might erupt. The shallow part of Kilauea’s magma system is conceptually well-understood. Long-period and short-period (brittle-failure) earthquake swarms outline a near-vertical magma transport path beneath Kilauea’s summit to 20 km depth. A gravity high centered above the magma transport path demonstrates that Kilauea’s shallow magma system, established early in the volcano’s history, has remained fixed in place. Low seismicity at 4–7 km outlines a storage region from which magma is supplied for eruptions and intrusions. Brittle-failure earthquake swarms shallower than 5 km beneath the rift zones accompany dike emplacement. Sparse earthquakes extend to a decollement at 10–12 km along which the south flank of Kilauea is sliding seaward. This zone below 5 km can sustain aseismic magma transport, consistent with recent tomographic studies. Long-period earthquake clusters deeper than 40 km occur parallel to and offshore of Kilauea’s south coast, defining the deepest seismic response to magma transport from the Hawaiian hot spot. A path connecting the shallow and deep long-period earthquakes is defined by mainshock–aftershock locations of brittle-failure earthquakes unique to Kilauea whose hypocenters are deeper than 25 km with magnitudes from 4.4 to 5.2. Separation of deep and shallow long-period clusters occurs as the shallow plumbing moves with the volcanic edifice, while the deep plumbing is centered over the hotspot. Recent GPS data agrees with the volcano-propagation vector from Kauai to Maui, suggesting that Pacific plate motion, azimuth 293.58 and rate of 7.4 cm/yr, has been constant over Kilauea’s lifetime. However, volcano propagation on the island of Hawaii, azimuth 3258, rate 13 cm/yr, requires southwesterly migration of the locus of melting within the broad hotspot. Deep, long-period earthquakes lie west of the extrapolated position of Kilauea backward in time along with a plate-motion vector, requiring southwesterly migration of Kilauea’s magma source. Assumed ages of 0.4 my for Kilauea and 0.8 my for Mauna Loa are consistent with this model. Younger ages would apply if Kilauea began its growth south of the locus of maximum melting, as is true for Loihi seamount.